Houston, Texas, March 5th, 2013 – One Child out of 88 in the United State is being diagnosed with Autism and the number continues to increase. As April is the Autism awareness month, “Together For Autism Foundation” of Houston, in a partnership with “Sigma Child Therapy and Developmental Services” is presenting Houston with the First Autism Festival that will take place April 6th & 7th in Downtown Houston. 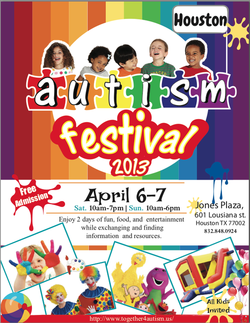 The purpose of the Houston Autism Festival is to create Autism awareness within the local community and to provide entertainment and a fun weekend for kids while allowing parents to meet each other and exchange experiences and life stories. The Festival is also designed to allow parents as well as providers, educators and government organizations to meet in one location so the benefits of these meetings can be maximized and the effort of both parents and providers can be reduced. As many Kids with Autism are known to have a one unique ability that distinguishes them from many others, It is also the purpose of the Autism Festival to look for those kids and present their talent in an effort to encourage parents and educators to grow those talents in a useful manner that can help, the child, the families and the community. The program of the festival will have several segments throughout the 2-day event including Autism talent shows, Magic shows, kids contests, prize drawings, as well as several entertainment shows and presentations tailored to the like of the kids, their parents and providers. Face painting, games, moonwalk and trampoline jumping will be available for the kids on the grounds of the festival. TV cartoon characters will be on the ground to interact with kids and offer photo opportunities. Several specialized providers and advocates and a wide selection of useful assistive devices, toys, books and assessments designed for kids with autism will be presented and available by vendors. Throughout the event, guests will have a chance to eat and entertain while exchanging knowledge and information. This family friendly festival will appeal to the taste and interest of children, parents and everyone involved. The Festival opens its door to all children and those without known disability to come and share with friends and families this unique event. The goal of Together For Autism Foundation is to anchor the Autism Festival project as an annual event, to empower the parents and the autism community and to offer an annual landmark event that people cherish and look forward to. Together for Autism is a young non-profit charitable organization founded to provide, the Autism community in the greater Houston area with appropriate tools and resources that can ultimately help parents and providers to offer more suitable care, treatment, social interaction and academic advancement for kids with Autism.